ADELANTE, based in Los Angeles, entered its 22nd year of publication with its June 2018 issue. PETER BARTIS, a folklore expert who is credited with leading the development of the Library of Congress’ AMERICAN FOLKLIFE CENTER, died on December 25, 2017, of complications from lung cancer. He is survived by his husband GEORGE BENJAMIN ZURAS. He was 68. 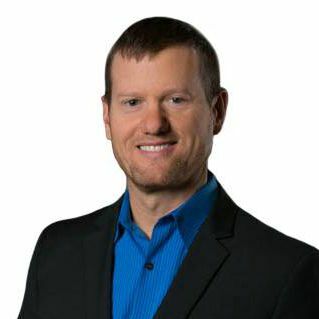 BEN FINZEL is behind a new a new private list and Facebook group for LGBTQ communications professionals in Washington, D.C., with the goal of fostering professional development and networking. If interested in joining the list, email info@renewpr.com. GED, which stands for GAY ENTERTAINMENT DIRECTORY and is based in Long Beach, Calif., entered its sixth year of publication with its June 2018 issue. HELLO MR., based in Brooklyn, N.Y., is closing after six years and 10 issues. JAMES SAKEZLES, known as JIM KELLY as a South Florida radio personality from the 1960s to the early 2000s, died on March 17, 2018. He was 64. 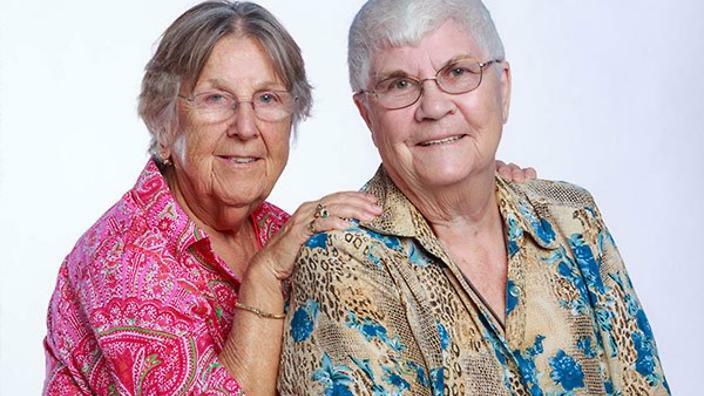 CONNIE KURTZ, the activist who appeared with her wife RUTHIE BERMIN in the documentary RUTHIE AND CONNIE: EVERY ROOM IN THE HOUSE, died on May 27, 2018. She is survived by Berman. Kurtz was 83. GEOFF MANASSE, the famed Seattle-based photojournalist and commercial photographer, died suddenly on January 19, 2018. His 1995 book of photographs and interviews of 24 gay and lesbian families called MAKING LOVE VISIBLE: IN CELEBRATION OF GAY AND LESBIAN FAMILIES won a National Lambda Literary Award. He is survived by his husband BAO LE and his sons KAI LE and KENNETH LE DO. He was 77. TUESDAY MAHRLE and KAELY MONAHAN, of the podcast WHISKEY AND POPCORN, are the newest contributors to Phoenix-based ECHO Magazine. They are behind the magazine’s new monthly “At The Box Office” film previews column. THE NATIONAL LGBT CHAMBER OF COMMERCE is holding its largest annual conference in Philadelphia this year, with up to 5,000 people expected from August 14-17. OUTSMART, based in Houston, Texas, published its largest issue ever - 212 pages - in June 2018. THE WASHINGTON BLADE, based in D.C., was named a sponsor of Major League Baseball’s All-Star Week. The game and related events took place in mid-July at Nationals Park and other locations throughout the nation’s capital. More than 75 percent of LGBTQ people say they tend to support companies that market to and support the LGBTQ community. That’s just one tidbit from the 12th Annual LGBTQ Community Survey report, which was recently released by San Francisco-based market research firm Community Marketing and Insights (CMI). More than 40,000 respondents from LGBTQ communities in 151 countries participated in this year’s survey. More than 200 LGBTQ media outlets, events and organizations worldwide partnered with CMI, helping to gain wide representation of respondents. David Paisley, senior research director for CMI, said he has noticed a shift in survey results given the current presidential administration. Of the 18,000-plus LGBTQ survey respondents living in the United States, 76 percent fear there will be a roll back of recent equality gains in the coming year. In the business realm, 85 percent agree that corporations that support LGBTQ equality are more important than ever, and 76 percent agree that companies that support LGBTQ equality will get more of their business this year. There is also wide support for companies that support the transgender / gender-expansive community. Three quarters of respondents feel more positive towards companies that include transgender / gender-expansive community imagery in their outreach communications. However, only 6 percent think that corporations are currently doing a good job at outreaching to the transgender / gender-expansive community. When asked if they live in an LGBT-friendly country, 5 percent of LGBTQ Americans strongly agreed that the United States was LGBT-friendly, 52 percent somewhat agreed, 43 percent somewhat or strongly disagreed. This is in strong contrast to Canadians, where 62 percent strongly agreed they live in an LGBT-friendly country, 36 percent somewhat agreed, and only 2 percent somewhat or strongly disagreed. The CMI team has been conducting LGBTQ consumer research for over 25 years. Their methodologies include online surveys, focus groups (in person and virtual), in-depth interviews and advisory boards across the United States and globally. CMI will be hosting a webinar to not only review the survey results, but also interpret the data to help our clients reach their sales and outreach goals. The webinar, which will focus on United States respondents, will take place on Thursday, July 26, 2018, from 10am-11am Pacific Time. Go to https://register.gotowebinar.com/register/794545976477976833 to register for the free webinar. 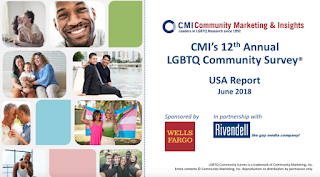 Timed to the release of the report, CMI also debuted its new website at https://communitymarketinginc.com, better-organized to help those interested find this and other research reports on a variety of LGBTQ topics and issues for free download, as well info about our conferences and corporate training. 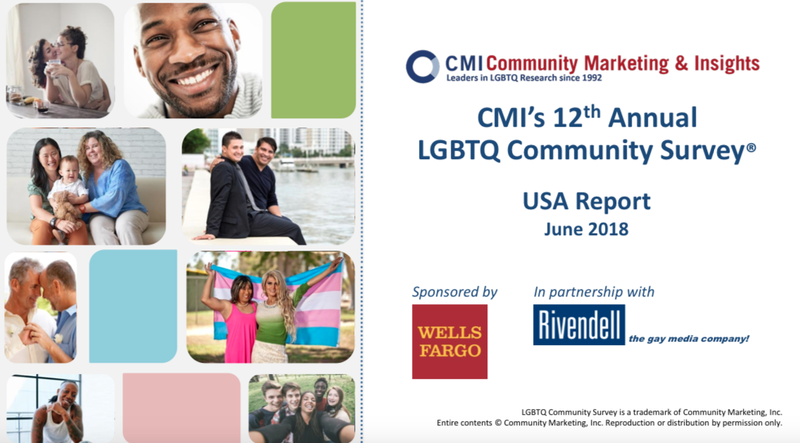 Go to http://research.communitymarketinginc.com/public/XBZj/zMz/subscribe to request a downloadable copy of CMI’s 12th Annual LGBTQ Community Survey report, available at no charge. The survey was completed in partnership with Rivendell Media, which publishes Press Pass Q. The NLGJA Journalist of the Year honor was awarded to celebrated reporter Ronan Farrow, whose articles in The New Yorker magazine are credited with helping to uncover the Harvey Weinstein sexual allegations. The Sarah Pettit Memorial Award for the LGBTQ Journalist of the Year was awarded to Diane Anderson-Minshall, editor-at-large of The Advocate and editor-in-chief of HIV Plus Magazine. "I am blown away by the work that was created in 2017," said NLGJA President Jen Christensen. "While it was difficult to select winners from such a talented pool of submissions, I am so proud that our panel of judges has recognized these award winners. These recipients have set the bar for coverage of our community and have given me hope for increasingly terrific LGBTQ coverage in the years to come." 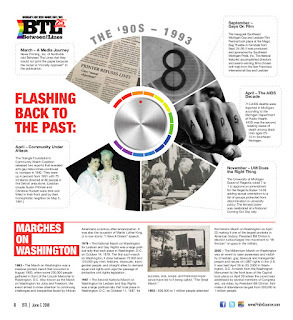 NLGJA’s Excellence in Journalism Awards were established in 1993 to foster, recognize and reward excellence in journalism on issues related to the LGBTQ community. In recent years, the program was expanded to over 30 categories and this year included the creation of awards for Excellence in Food Writing, Excellence in Queer People of Color (QPOC) Coverage and Excellence in Longform Journalism. The awards will be presented throughout the NLGJA National Convention to be held September 6-9 in Palm Springs, Calif.
Another high-profile honor, the Al Neuharth Award for Innovation in Investigative Journalism, went to Ken Schwencke for “Why America Fails at Gathering Hate Crime Statistics," for ProPublica and the Documenting Hate Coalition. For more information about NLGJA’s upcoming convention, go to www.nlgja.org/2018. The rest of the 2018 NLGJA Excellence in Journalism Awards — including those honoring LGBTQ media — are listed below. PRESSING QUESTIONS: Empty Closet of Rochester, N.Y.
Staff size and breakdown: (writers, editors, designers, etc. ): Two, myself as editor and main writer, and a designer. Other contributors are volunteers. PPQ: What feature or features of Empty Closet have been the most popular with readers? Editor Rowan Collins: The publication has changed fairly dramatically over the last year but our readers have always enjoyed local stories, whether they are interviews or profiles or breaking news that is deeply impactful on our local community. Collins: Since it was initially published in 1971, the Empty Closet has faced numerous obstacles and challenges. Funding, resources, and social animus were some of the initial challenges — as issues were not accepted in many public institutions or businesses. PPQ: What challenge or challenges is Empty Closet facing now? Collins: Funding has kept the Empty Closet as a one-to-two person operation for decades now. Our previous editor, the illustrious Susan Jordan, served as the sole staff from 1989-2017 with a contracted designer. I follow in the same model. We don’t have active beat reporters or department writers or staff photographers or columnists on a payroll. It makes it difficult to catch all the stories and cover all the events and people in our vibrant, diverse community. PPQ: How has Empty Closet changed since it was first launched? Collins: As the oldest LGBTQ publication in New York and one of the oldest, continuously published LGBTQ publications in the country, the Empty Closet has changed immensely. We began in January 1971 as a four-page ditto and have transformed over the years into a 40-page newspaper and now magazine. Coverage, inclusion, diversity of contributors, stories, political landscapes, and editorship has changed tremendously and will continue to change for decades to come. Collins: I’d love to be able to bring writers and photographers on as staff. We have immense talent in our area and community contributors with incredible ideas, drive, and passion for telling the stories that matter. As a publication housed in a small non-profit organization, we simply don’t have funding to expand our staff. PPQ: What has been the biggest news story or stories Empty Closet has covered? Collins: I think it would be reductive to say any one story was the biggest, considering this publication’s 47-year history. We have covered the de-pathologizing of homosexuality, the AIDS crisis, national elections, local firsts, marriage equality, Don’t Ask Don’t Tell, transgender healthcare, intersectional justice, art, and so many other stories. Collins: Our publication aims to include and amplify the voices of our entire community, which is not exclusively 6s, so to speak. We have contributors from, and stories regarding, the trans and gender-expansive community, bisexual folks, gay, lesbian, pansexual, and queer identified people. Collins: I think there is a certain extent to which, as a publication by and for a specific marginalized community, most of what our publication has done in the last 47 years could be considered advocacy journalism. We have told the stories of people that mainstream media would either like to forget, refuse to cover accurately out of fear, ignorance, or both, or exploit for views. Collins: I recently had an LGBTQ high school student say that they read copies of the Empty Closet at their local library, gathering the courage to come out to their parents. They said that knowing there was a strong, vibrant, and supportive community right here in Rochester made it so much easier to have the conversation and that they asked their parents to subscribe when they came out, so they could all read it together. Collins: Know your market. 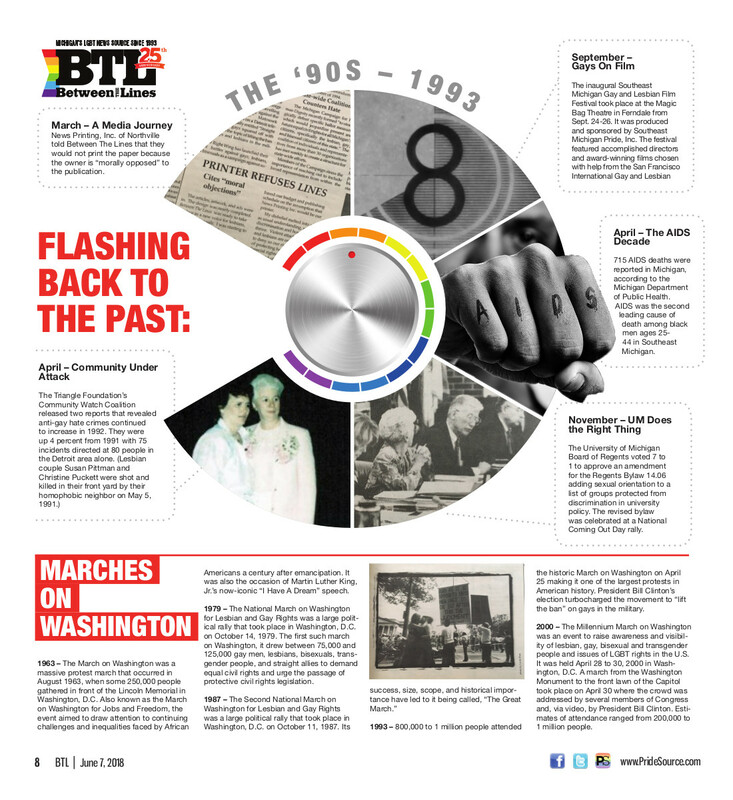 We are lucky in some respects at the Empty Closet to have such a strong, stable history as the LGBTQ publication for Rochester and much of Western New York. We know our readership and we know our area. The stories and editorials flow from there.